An organic, protective, ultra-gentle Sun Lotion - SPF30. As sun damage accounts for 90% of premature ageing, protecting your skin from the sun’s harsh rays is paramount to keeping skin looking young and supple. 97% of UVB rays are blocked with an SPF30 sun lotion – only 1% less than an SPF50 lotion. Applying liberally and frequently also ensures maximum protection. 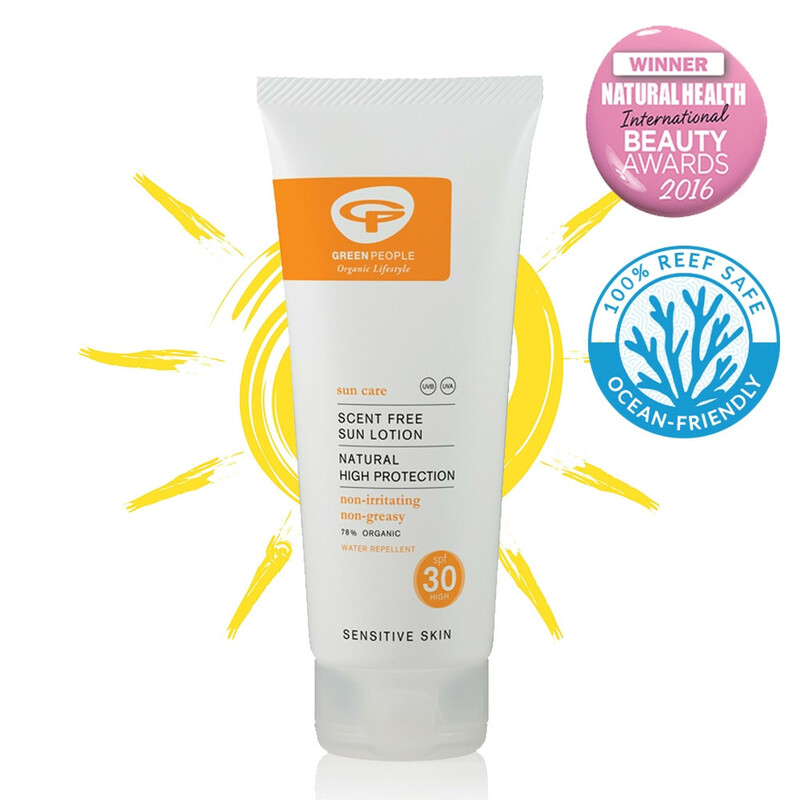 Green People Scent Free Sun Lotion SPF30 has the perfect broad-spectrum protection: UVA (to protect against Ageing), and UVB (to protect against Burning). This lotion is packed with antioxidants, is water-repellant and won’t clog your pores. Main ingredients include Organic Aloe Vera, Edelweiss, and Green Tea. Non-greasy and invisible on the skin, this is also suited to those who sometimes suffer from prickly heat. Skin Type: Suitable for all skin types, and sensitive skin including those prone to eczema and psoriasis. Application: Pour 30ml sunscreen into your cupped palm then apply to body 20 minutes before exposure to sun, then every 2 hours or after swimming. Tip: Perfect for ultra-sensitive skin. Matching Products: To soothe the skin after sun exposure and to maintain your tan for longer, try Green People’s Hydrating After Sun Lotion, which contains natural essential oils and has a wonderful cooling effect. Ingredients that Green People don't use in their products: Scent Free Sun Lotion SPF30 is made without parabens, alcohol (ethyl alcohol, ethanol), lanolin, methylisothiazolinone, methylchloroisothiazolinone, gluten, phthalates, artificial perfumes, petrochemicals and colourants to bring you the purest sun lotion that nature can offer.